Computer Repairs Pronto is totally Australian owned, and has been serving Sydney home and business users for over 20 years. We have a large client base and continue to strive for the highest standards attainable. We pride ourselves on our professionalism, and extensive knowledge in everything IT. We will always endeavour to find a solution to your problems, as we believe and maintain all problems are fixable, and appreciate that computers have become a part of everyday life and therefore play a very important part in business, education , communication with family and friends and entertainment. We aim to please and that is our motto. Alot of our work comes from referrals, which bears testimony itself. Computers Repair are what we do best, repairs, upgrading, tweaking , setting up, installing, teaching, software troubleshooting or simply wanting free advice, you can turn to us with confidence in the knowledge that you are dealing with a highly qualified group of technicians. We cover all brands of desktop and laptop computers, PC and mac repair, and will travel all over Sydney to service your needs. It all starts with a simple phone call, so if you feel you need some friendly free advice, or want to book a technician for an onsite visit , we are here to help you! We also offer data recovery services for all types of storage media includes hard drive, USB sticks, memory cards etc.. 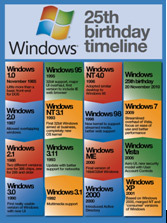 Here is an image of the history of windows and the time line history of the modern computers we have today!